At the Cork Road project, the E-Clay Stabilisation Technology was applied using an in-situ approach to remediate contaminated soil and groundwater at a site. The contamination at the site was attributed to the Petrol Station located next to the site. It was considered that leaking pipe work and storage tanks were responsible for the ongoing hydrocarbon contamination to soil and groundwater. The remediation strategy for the Cork Road site comprised a three stage approach. The first stage involved the installation of a slurry wall along the western and southern boundaries to prevent further ingress of contaminated groundwater from the petrol station. The second phase involved the bioremediation of contaminated materials associated with the slurry trench barriers and a 0.5m layer from across the top of the site. The final stage involved the chemical and physical stabilisation of soils below the building footprint. Envirotreat employed an in-situ soil mixing strategy to remediate approximately 9,200m³ of contaminated soils at the site. The works were conducted over a period of 3 months under a Site Specific Licence issued by the Environmental Protection Agency. Specialist technology, materials and supervision were supplied by Envirotreat, whilst Keller Ground Engineering supplied all the required plant, and labour for application of the Envirotreat stabilisation process. 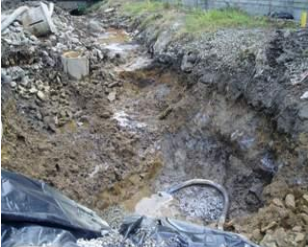 The in-situ process allows for the remediation of contaminated soils to take place without the need for the contaminated soils to be excavated and stockpiled. The process involved the use of a Continuous Flight Auger to install soil mixed columns to depths ranging from 1m to 4.5m. A slurry production unit was used to produce the E-clay slurry before being pumped through the hollow stem of the Auger. The Auger is then drilled into the ground whilst continually injecting the treatment slurry until the desired depth of the column is reached, at which point the pumping is halted and the auger reversed.